If you haven't read part 1 - 5 you can do so here. 'Carddies Limited is owned by two sisters, Raquel and Esther.During a rainy seaside holiday Raquel started drawing little card people for her three house bound girls, using the backs of cereal packs and any card to hand'. 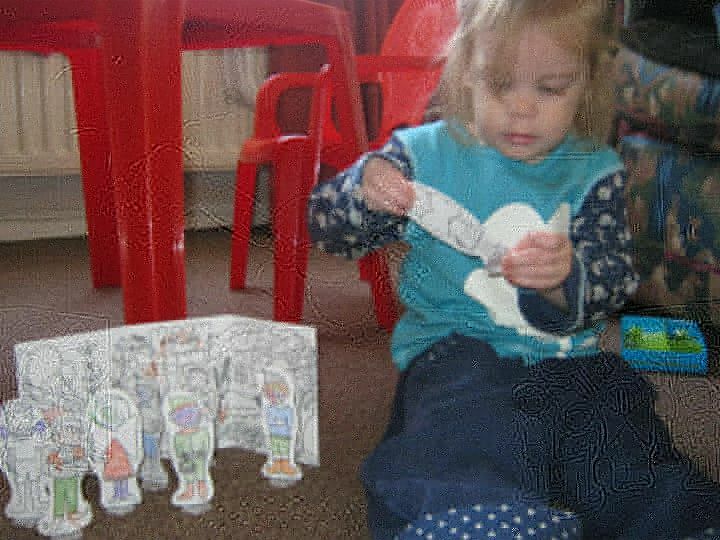 'Since then Raquel has drawn hundreds of little card people for many children, who love them and play with them for hours'. 'Raquel and Esther joined forces to develop this lovely idea into a business and so the Carddies evolved'. 'Their past experiences working as a lawyer and accountant respectively, and as full time mothers of their seven children, have been useful'. I found that the Carrdie set was brilliant on rainy days, also very ideal for children when travelling wheter it is by car, air plane it doesn't matter because Carries set's are small and also come with crayons so there is not faffing about to buy a pack of crayons. I was sent the fairies set for Alesha to review. I can honestly say she got loads of enjoyment from it. It was lovely to see her using her imagination when thinking where to place each fairy infornt of the scene. Carries have only launched this toy, just in time for Christmas! I personally wouldn't pay £8.99 for a set because after Alesha had coloured and had fun with them on the first day, she wasn't bothered with them the following day. Frugi's important mission... to be the most desirable and trusted clothing brand on the planet! We improve the lives of everybody on Planet Frugi, from the people who grow our cotton to the people who wear our clothes. 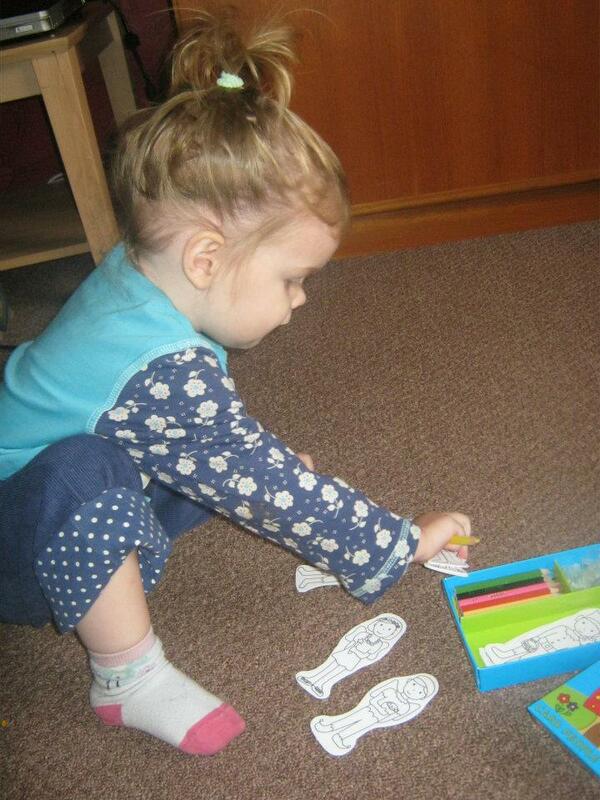 We design clothes that children love to wear. We have fun along the way! 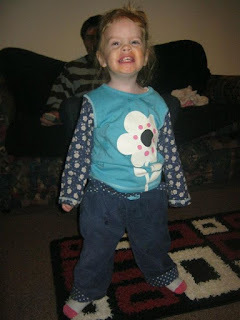 I was sent 2 of Frugi's lovely items for Alesha, a dizzy daisy patchwork top which retails at £18 and also a pair of the lined cord roll ups -navy which retails at £26. I asked for size 18-24 months in both of the item's, the lined cord roll ups are abit long for her at the minute, but I expected that because many of her 18-24 month's clothes are still slightly too big even though Alesha will turn 2 next month! The trousers were thick, they kept her legs warm which is brilliant for these winter months. I put the clothes to the test by putting them in the washing machine and out they came in their normal shape and size. Frugi's brand new gift box makes a lovely present too. They have a SALE on at the minute so why not pop on over and have a look, you might find a bargain just in time for Christmas. Scrumptious organic clothes at reasonable prices! We all love a good book especially in the winter time snuggled up on the couch with the fire on. With Christmas fast approaching here is a wonderful book that I would recommend to families young and old, 'The Night Before Christmas', it's a Christmas must-have! 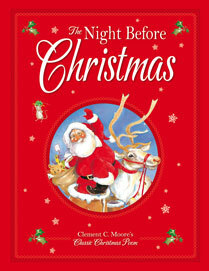 With it's luxurious (and durable) padded cover and timeless illustrations of this classic, much-loved Christmastime poem by Clement C. Moore, our edition can easily become a family tradition. Gathering together at Christmastime and reading to the children, "The Night Before Christmas" is an investment in family Christmas tradition (rather than perhaps a Christmas gift). With an RRP of £6.99 it's a fabulous price for such a quality, timeless book. Mr.B decided to read this to me & Alesha the other night, we all snuggled up on the couch and settled down for a good old Christmas tale. The book had big colourful photos great for little minds with big imaginations. We have now put this book away but will definitely be taking it back out on Christmas Eve to read again and we will do so every year. 'With the recession biting, we realised that there is no better way to put a smile on someone's face than to send them a gift that reminds them of the good times'. 'This spurred us into action and allowed us to start Posh Pick & Mix'. 'We focus on sending high-quality, delicious gifts with a real 'wow' factor'. 'We pride ourselves on choosing the best, most suitable jars and sweets to make the perfect gift'. 'We cater for individuals and businesses alike – no order is too large or too small'. When I received an email asking if I would like to review Poshpickandmix there was no if's and but's about it, I said yes straight away, "you gotta be a fool to turn down sweets right"? I then clicked on to their site to have a good old nosy, "what a wonderful gift idea I thought". Are you wondering what sweets you can pick? There is a very wide range of sweets from the old favourite's mini wham bars to the fizzy cola bottles and especially for Christmas they have Santa and snowmen chocolate! I love the sweetie jar I was sent, it looks very posh sat on my display cabinet and on the label it says 'Gill's Christmas Sweet Jar'. I've had a few visitors say positive's things about it and also asking where I purchased it from. A brilliant gift for a loved one, young or old! The wonderful thing is you can re-use the jar so once the sweets run out just fill it back up with your own, clever ay? Pop on over to www.poshpickandmix.com to have a look for yourself! christmas coloring pages for kids if you like.